Around 1966 Grant Green’s life and career had fallen into a slump, due to a major drug problem and an alleged dissatisfaction with the music business that kept him from recording on a steady basis. This album, and how aptly titled it is, marked his comeback as a leader on the Blue Note label in 1969. It is a testimony to the funk. Green manages to bring a relatively mellow touch to funk gems such as The Meters’ Ease back and James Brown’s I don’t want nobody to give me nothing. It might have something to do with Green’s soft-hued tone, that blends well with his trademark fiery, repetitive runs that keep your head spinning as if it’s become a wheel on the merry-go-round. Its lightness is also in large part due to the airy sound of Clarence Palmer’s electric piano, which production-wise is a succesful left turn away from the equally soulful but dimmer sources of Hammond Boulevard. By 1969, Grant Green had assembled a tight outfit. In the hands of New Orleans native Leo Morris (a.k.a. Idris Muhammad), whose drums sound as crisp and clear as ever, and tenor saxophonist Claude Bartee, who stands out in particular with a red hot solo in Green’s uptempo sole original Upshot, grittiness is guaranteed. Carryin on might not have won over fans of Green’s earlier work. Yet it appealed to a new fanbase that was hip to musical and social changes and in doing so, along with a batch of contemporary recordings such as those of Lou Donaldson and Lonnie Smith, created a new vibe in modern jazz. Of course by now we know that same vibe from the mid-eighties on started a breakbeat craze that lasts well into this day. Back then Grant Green wouldn’t have imagined this, but trying to be a business man of sorts, with a knack for popular tunes and a reputation as one of the few top guitar players in jazz, Green must have asked himself a question: why not me? If my boy (George) Benson can do it! And who could blame him? 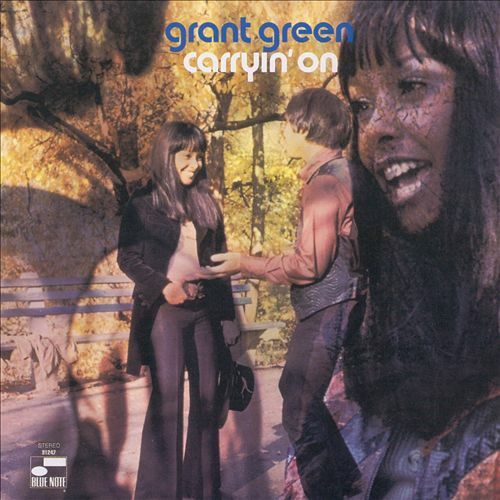 Versatile beyond comprehension, Green pulled it off as far as being groovy is concerned and soon Grant Green records came of Blue Note’s assembly line like cupcakes again. Although, in the end, they wouldn’t give him the greenbacks he so well deserved.